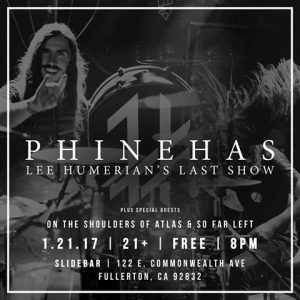 Lee Humerian’s reign as drummer of Phinehas has lasted from 2008 until the early days of 2017. Those days come to an end after Saturday night’s concert in Fullerton, California. Lee and his wife Katie are called to the eastern European country of Ukraine to work in youth missions. The kids over there will enjoy seeing his hair flying and learn about drumming. Music is involved in this mission. You can read about it more here: https://katieandleehumerian.com/ Humerian will track the drums on the next Phinehas record. Lee, you will be missed by The Blast and The Implosion!